Precise engine tolerances not only provide extended mileage, but add 5-10% horsepower to any engine. As with engine design, blueprinting and precise engine assembly is also often overlooked. Precise engine tolerances not only provide extended mileage, but add 5-10% horsepower to any engine. 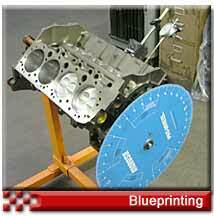 At FE Specialties, blueprinting is a cornerstone of our engine approach. 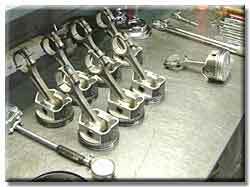 We determine through engine design, what clearances are necessary for each individual engine. Then we machine to .0001 of an inch the tolerance that we need. This insures not only good longevity of the motor, but also the extra horsepower that can be tapped from the motor. Each type of application determines different tolerances. Mild street motors run completely different tolerances than a drag motor or endurance motor. Marine applications also use different tolerance packages than any other type of engine. So getting the right tolerances is very important for each and every motor. We do this at FE Specialties.